My trip begins in Hässelby, a suburb to Stockholm where I live. 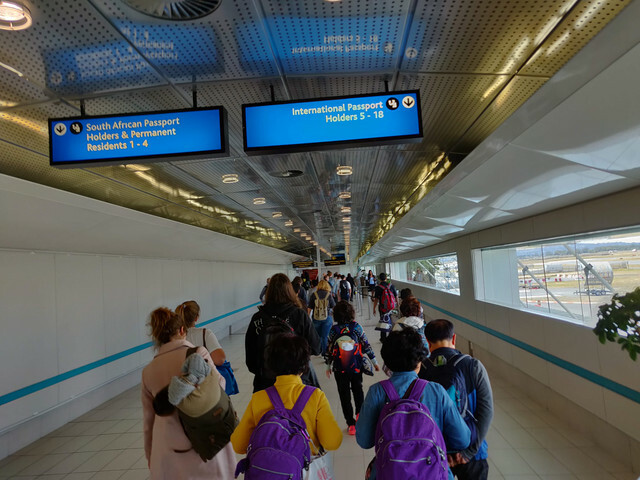 Me and my family had for over a year planned a trip to South Africa and Cape Town which we have visited before but always dreamt about visiting again. I am a 21-year-old Swedish man that is about 184 centimetres tall and have travelled a lot considering my age. 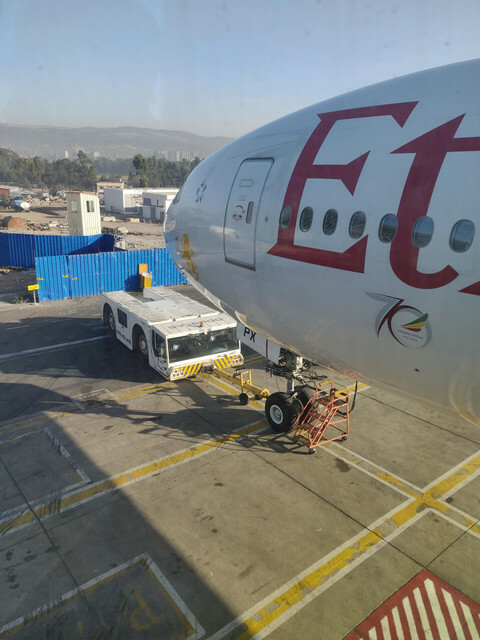 We had booked the whole trip with Ethiopian Airlines, from Stockholm Arlanda via Addis Ababa Bole to Cape Town. 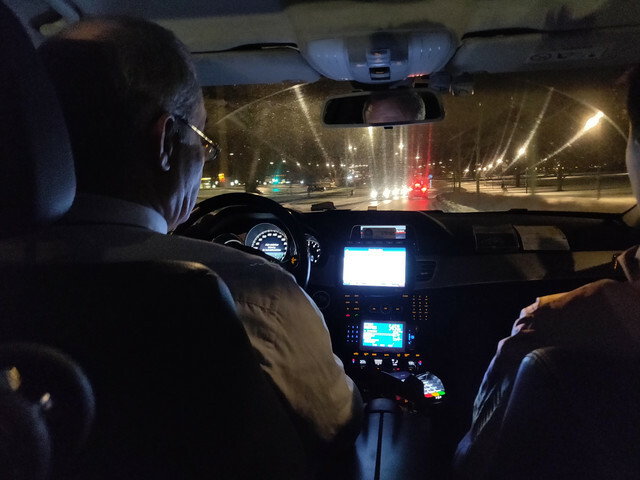 We left from a snowy and cold Stockholm with approximately 2 degrees Celsius in a taxicab to Arlanda on the evening of 26 of December. 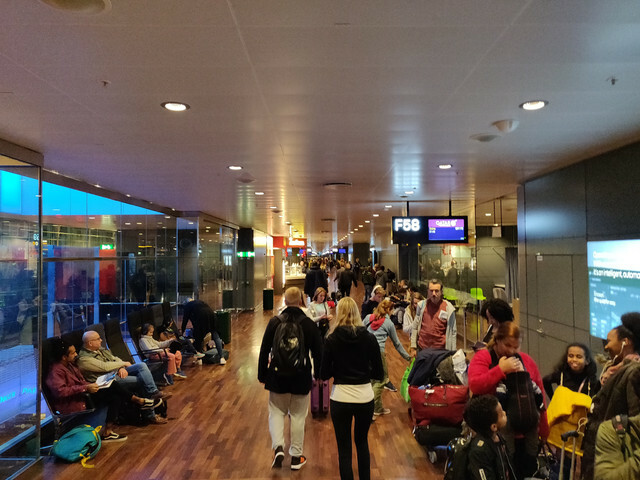 We were at the Arlanda terminal 5 about 3 hours before scheduled departure. The queue the check-in was already quite long, and all counters were surprisingly open. 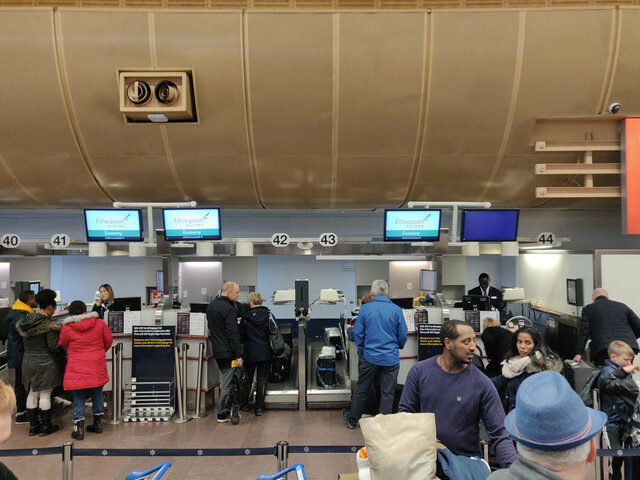 The check-in process went in a slow pace and all the staff was friendly and we gladly changed our seats when we asked if we could sit on the emergency exit row as well as ignored that our luggage was a bit too heavy. 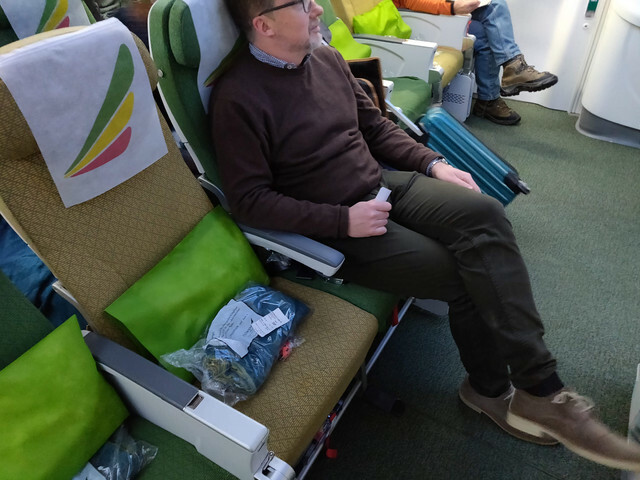 Ethiopian allows for two 23 kg baggage per passenger in economy which is pretty good considering it is the double amount of most other airlines. 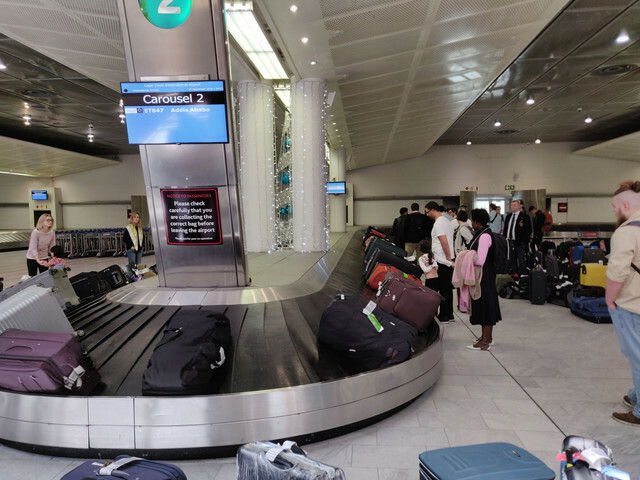 As we only had three luggage’s on four persons the staff could accept our slight overweight. 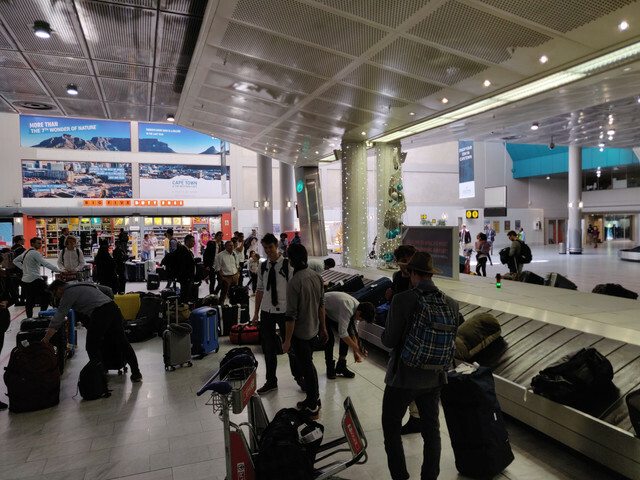 We then passed along the check-in hall and went towards pier-F. The security screening took longer than expected but it was fine since we weren’t in any hurry. We had some wraps that we made at home with us and just bought a bottle of wine at a restaurant called “OAK”. 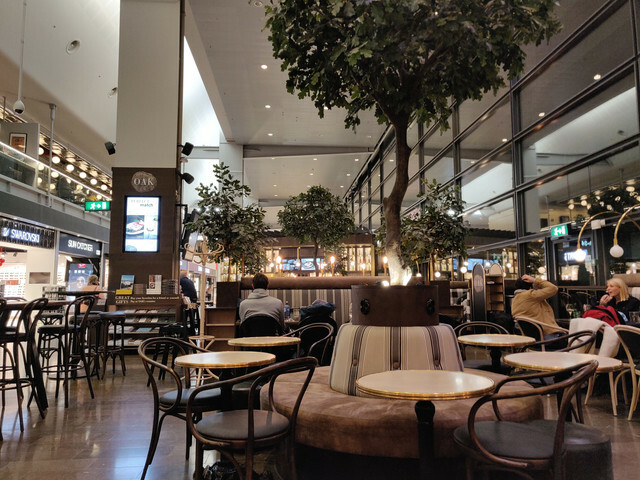 The offer at terminal 5 is a bit underwhelming and quite expensive so I could recommend all of you to bring your own food unless you want to eat at “Pontus in the air” which has really good food for a hefty price tag. 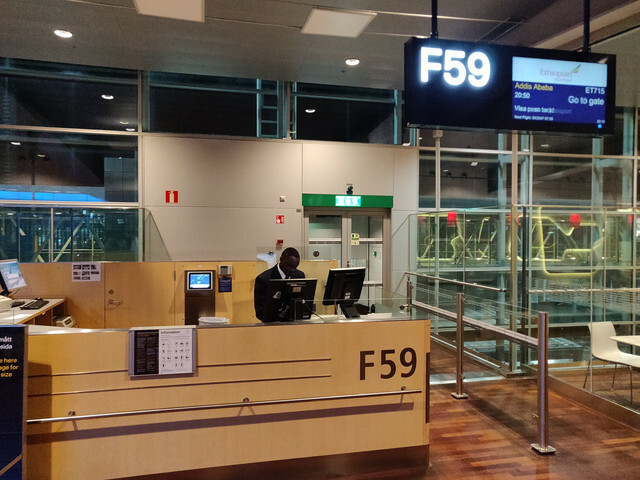 The assigned gate was F59 which is in the non-Schengen area. 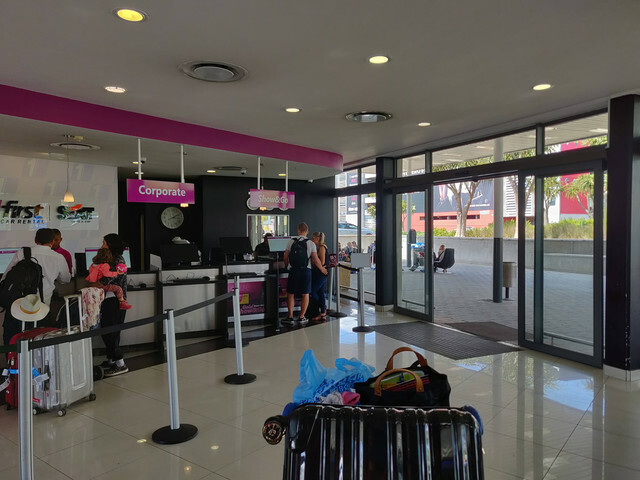 The passport control went fast and after entering this area there is now way back and here the service offer is even more underwhelming. 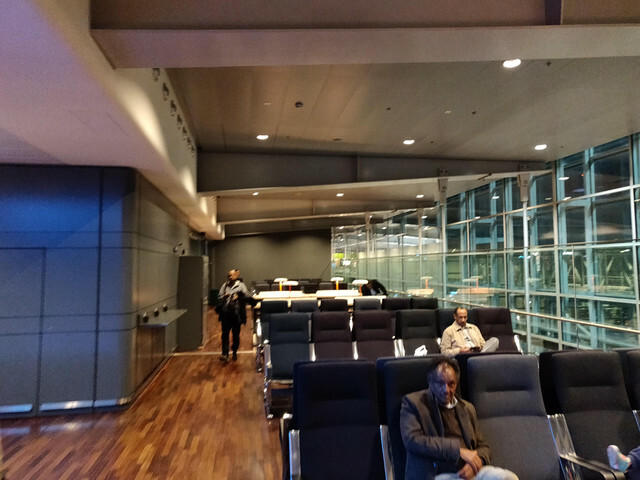 At this part of the airport they use pre-boarding which don’t work well at all. 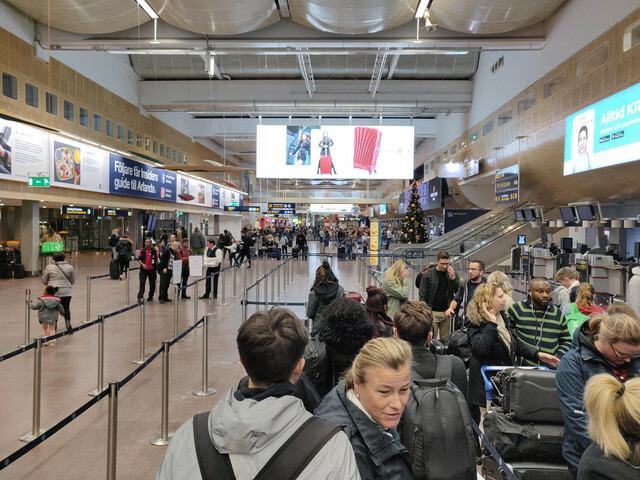 There is no place to queue and people are constantly passing for the other departing flights. 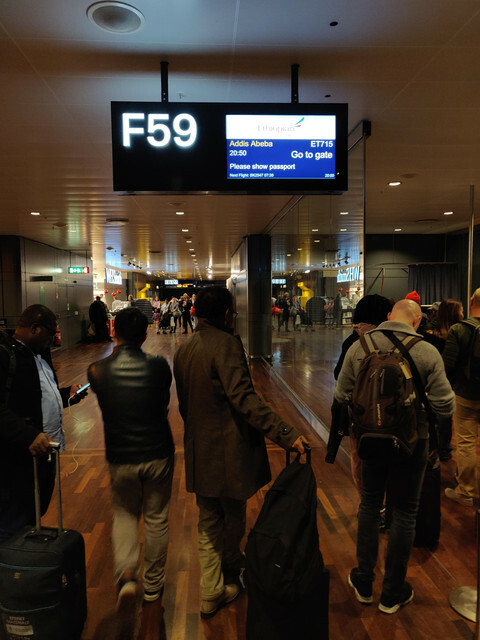 The pre-boarding process took a lot of time since they checked all the visas etc. for the passengers. 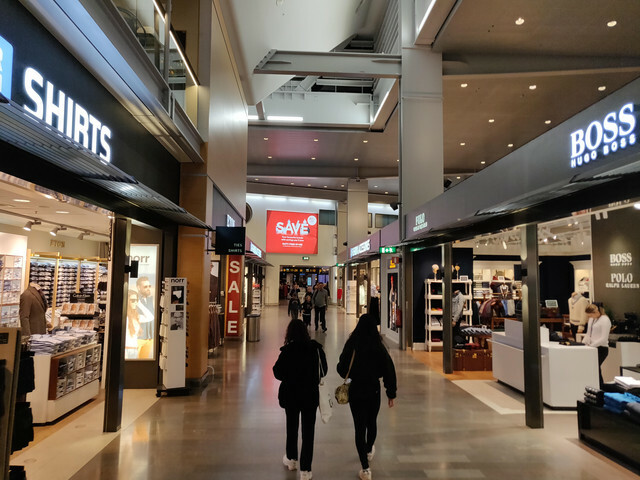 Once in this area there is only one toilet and literally no food or drink to buy. In our case they started boarding quite soon. The boarding took a lot of time and I was one of the first to board the plane. 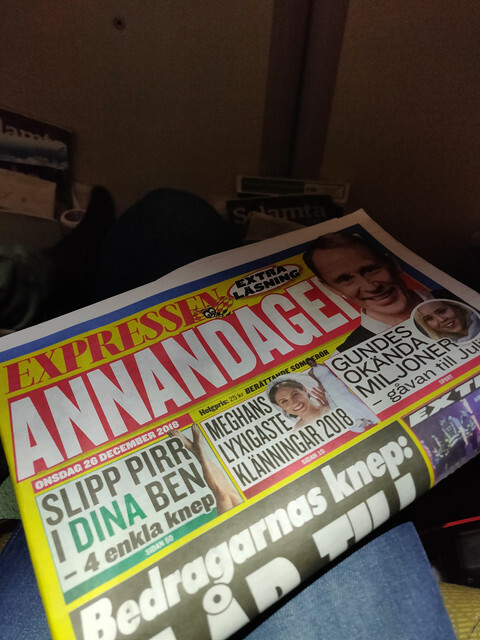 The plane was incoming from Oslo and already had passengers on it. We sat in the middle of the front row of the last section and had plenty of legroom. 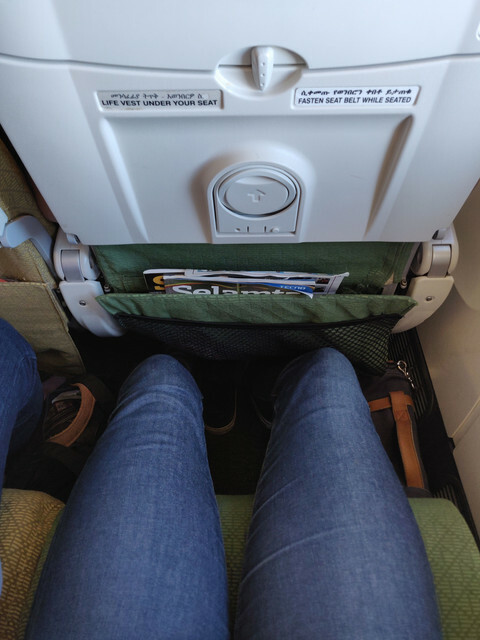 The drawbacks with sitting in the front row of the section is that you can’t have any luggage on the floor nor watching on the IFE during take-off and landing, slightly narrower seats, the fact that too many people decides to climb over your legs when moving between the aisles as there weren’t any possibility to pass in the galley. 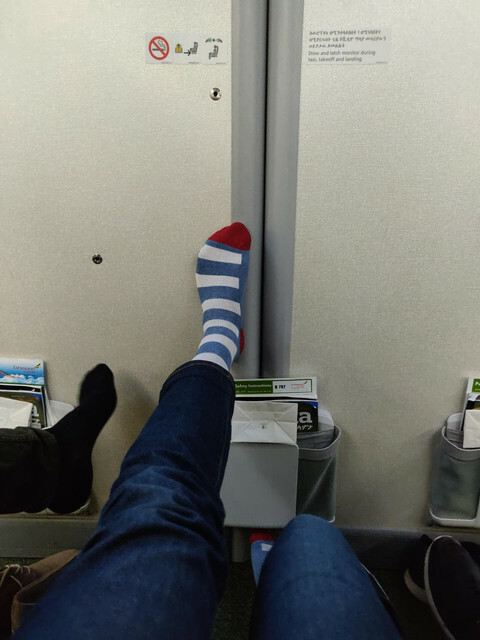 But the generous legroom was well worth it. 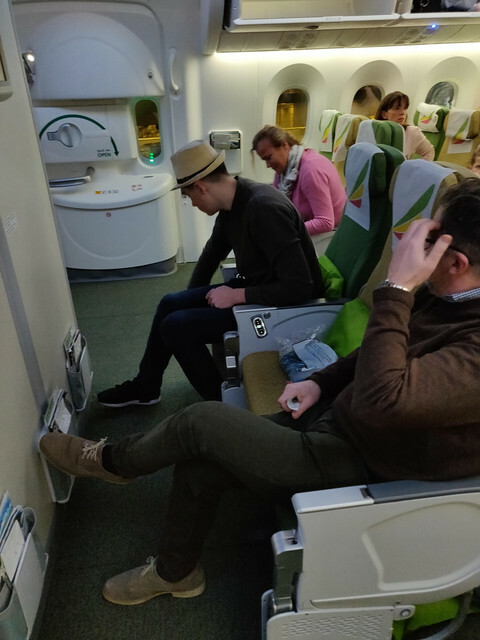 As we already discuss the seat I must mention the narrow width which really felt cramped during the whole flight, especially when eating. 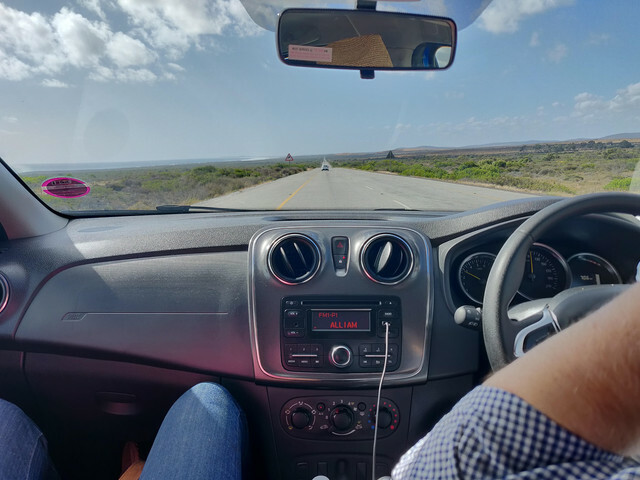 The seats had a generous amount of recline and was comfortable with a good adjustable neck rest. We got a blanket, a pillow and some cheap looking headphones. The sky interior and the adjustable lightning combined with the brand new and fresh interior really made the journey much more enjoyable. 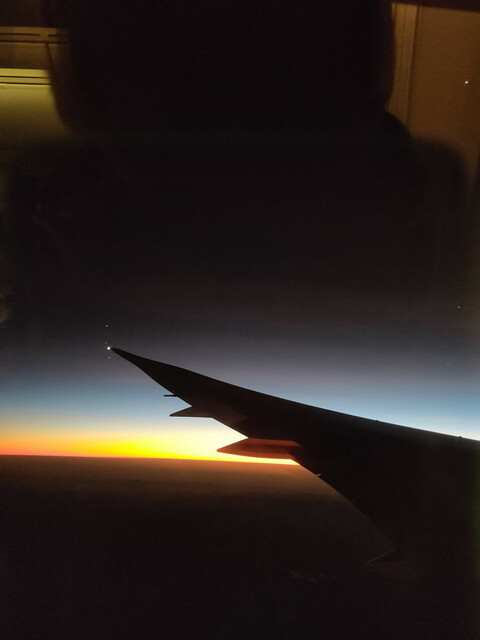 We departed about 50 minutes late and the estimated flight time was 7 hours which basically made up for it. Soon after take-off the started serving the first inflight meal. 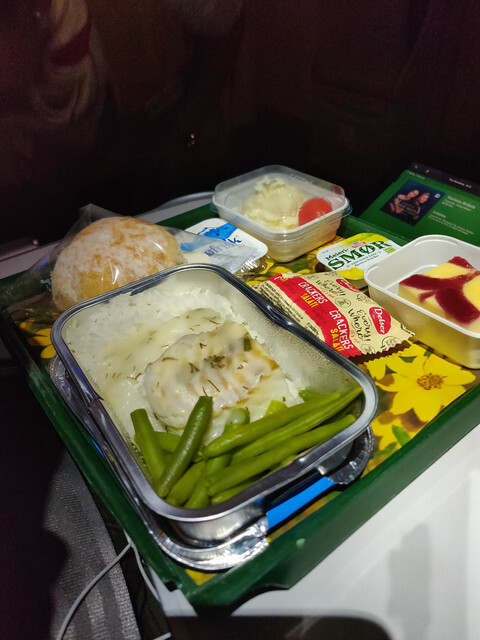 We didn’t get any menus like Turkish Airlines or Emirates but was faced with the choice between chicken and fish. 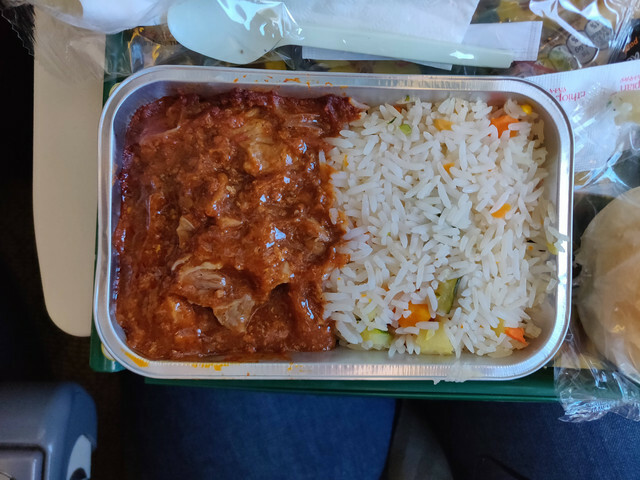 I choose chicken which was served with rice and was quite nice tasting but somewhat bland. The rest of the meal was good, the potato salad was maybe too heavy on the mayonnaise and the dessert and bread were fine. We also got served Ethiopian beer which was a nice complement. 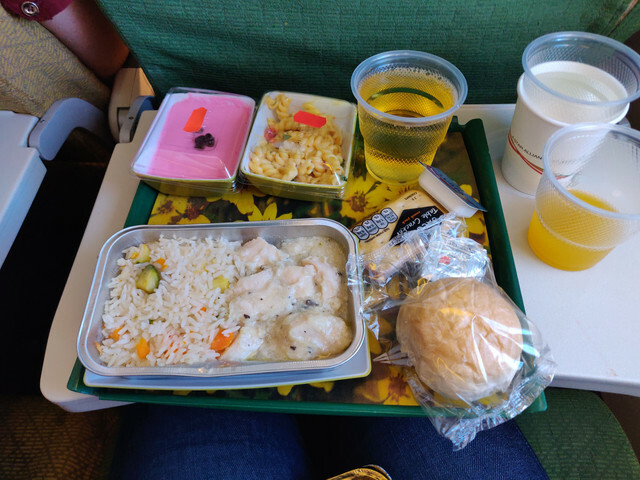 Not as good as some food eaten on Turkish Airlines but far from the worst I have tasted on an aircraft. After the meal service I tried to get some sleep as the cabin was dimmed and my stomach full. 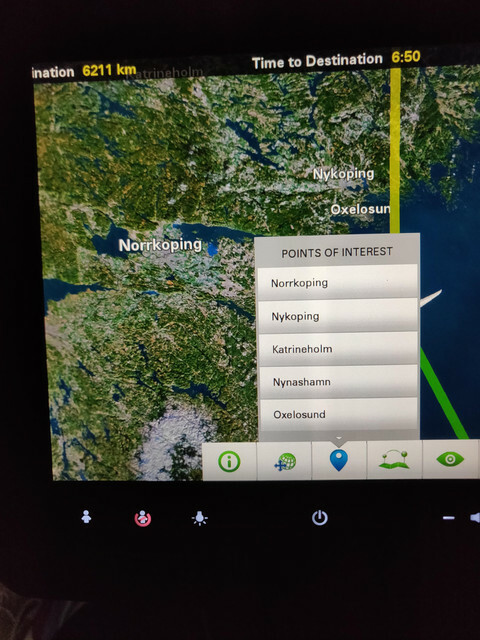 The only thing enjoying me during the flight was the constantly “dinging” noise as for someone pressing the assistant button above their seats. I don’t know if the sound was especially loud close to the crew telephones and seats located in front of us. I have never heard so much alert sounds on an airplane. 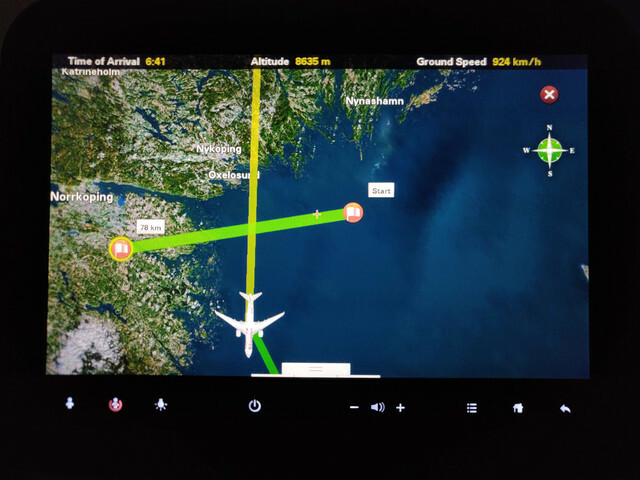 The IFE was surprisingly good on the aircraft, maybe not so unusual since the airplane is less than a half year old. 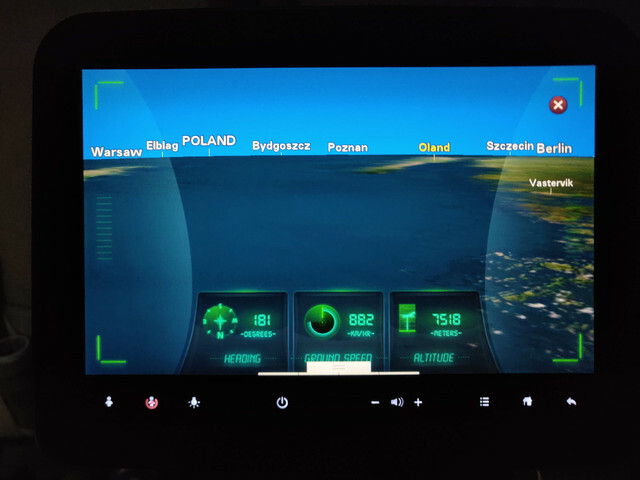 All menus where responsive and the map system was one of the most advanced I have ever seen where you could measure distances, show nearby locations and so on. There was also a good variety of movies and music, but the funniest thing was all the information about the airline. 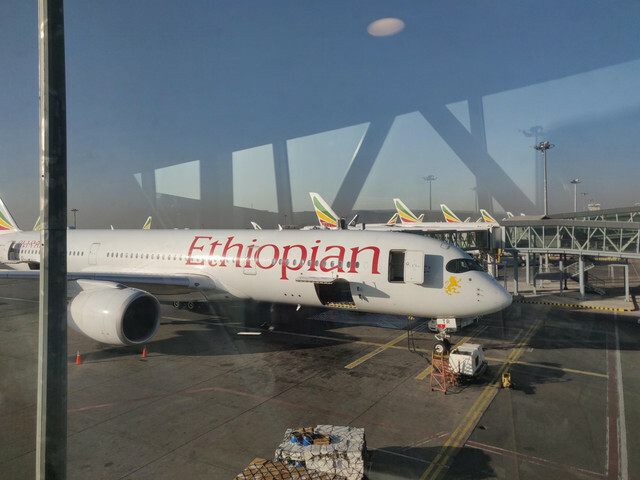 The had an entire page devoted to their maintenance facility and a page with Ethiopian Airlines finance results from the last ten years. 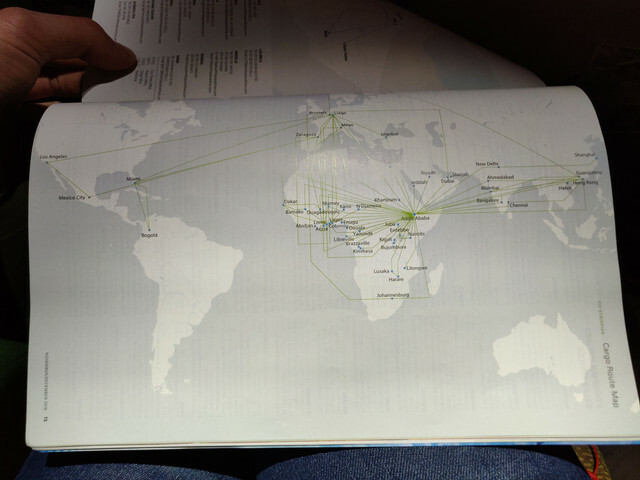 The inflight magazine “Selamta” also had an entire page with a cargo route map which I find amazing, I can hardly see how any passenger will find it interesting. 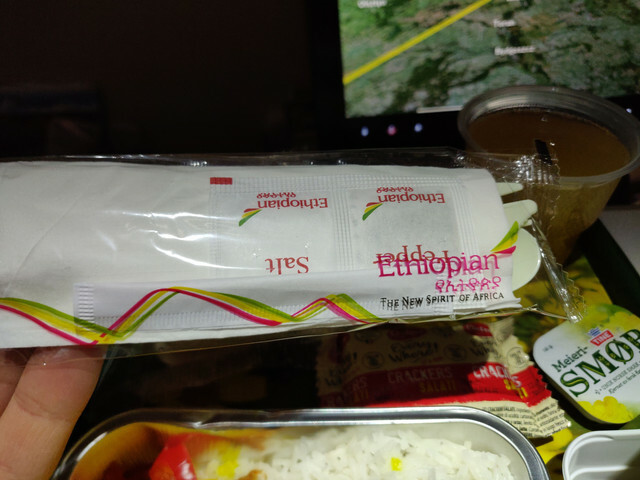 The second meal service was brought to us about one and a half hour before arriving in Addis Ababa. The clock was now 3:30 (Swedish time) and I wasn’t that excited for more food. At least I ate a bit of everything to be able to comment on it. 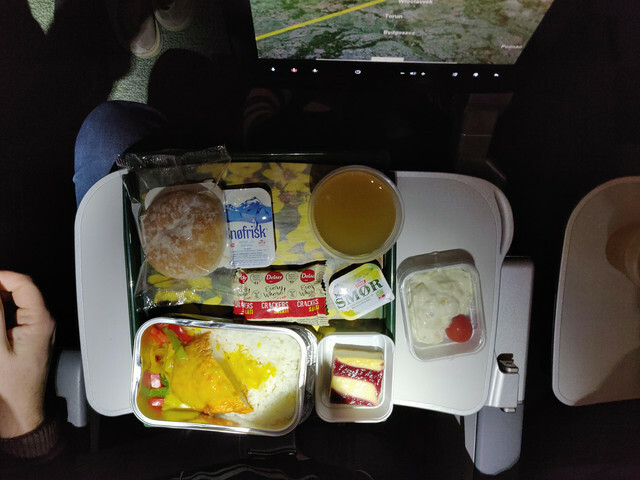 I really enjoyed that the breakfast wasn’t hot as I rarely like the scrambled eggs or mushrooms served on airplanes. The yoghurt, bread and fruits where perfectly fine and not too much considering the time in the morning. 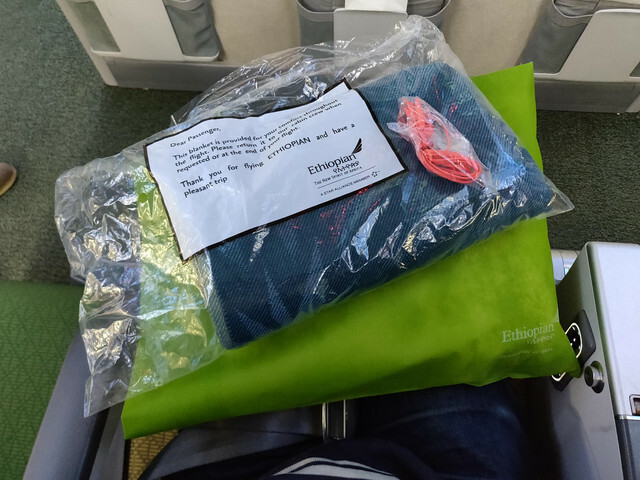 The service on the flight was average, the attendants was polite but not with the amount of attention I have seen on other airlines. 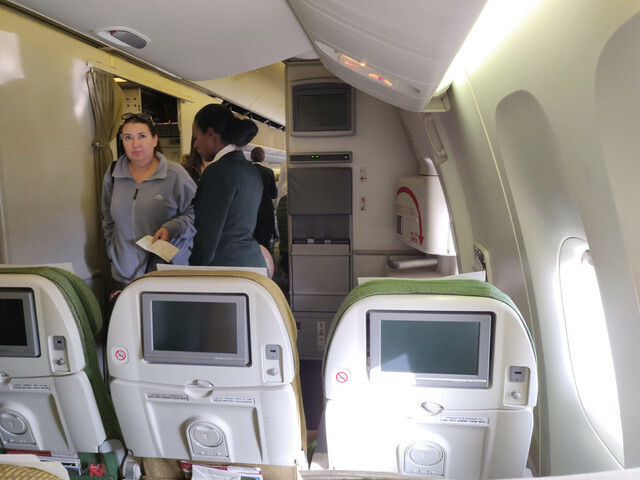 The last part of the flight, rounding Sudan (why?) 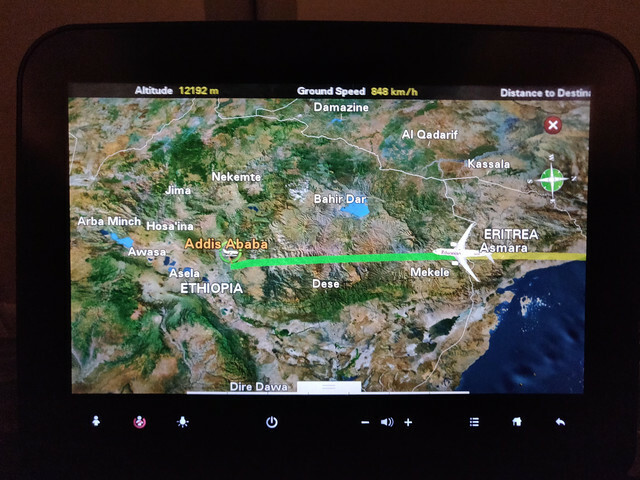 and entering Eritrea we encountered some turbulence which lasted until we landed. 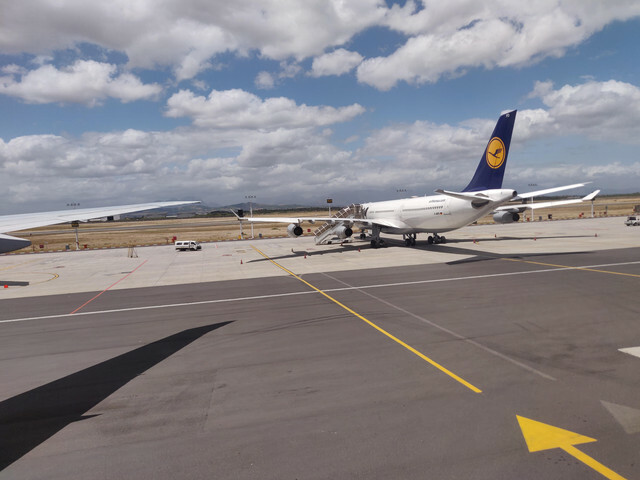 The landing was smooth but the we taxied for a long time before waiting even longer at the gate before unbuckling our belts. 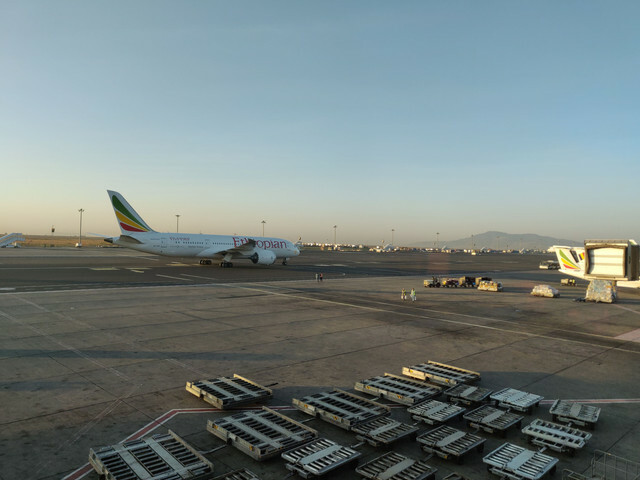 The sun has just started risen over Addis Ababa! 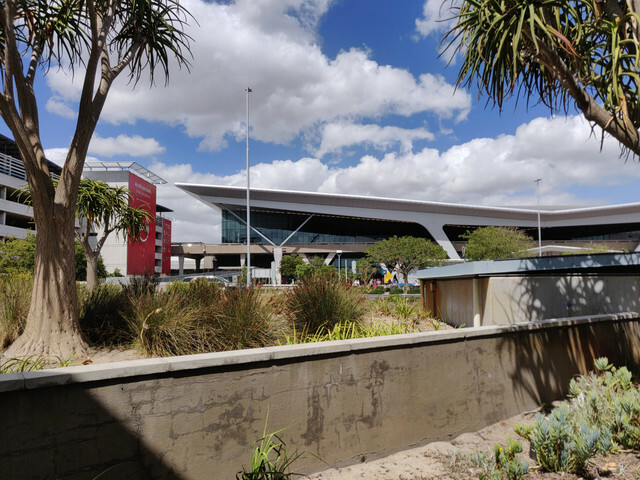 I had read a lot of reviews of Addis Ababa airport before this trip and my expectations was low. I thought that we had to pass through security which would be a hassle considering our transfer time was about one hour. But luckily, we didn’t need to! 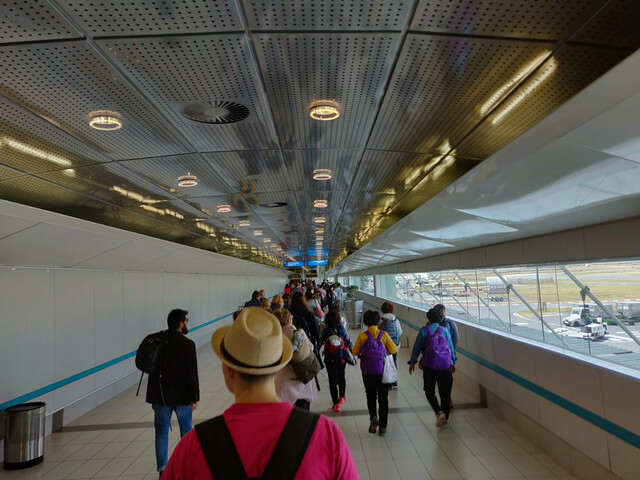 All passengers to connecting flights was separated and lead directly towards the departure lounge. 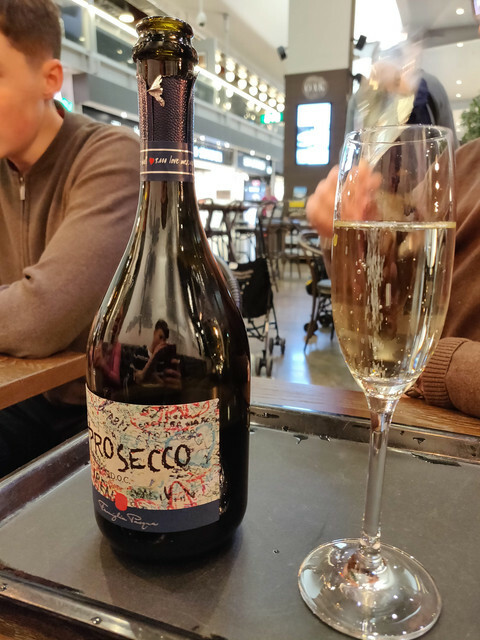 It was good but weird since I have been forced through security when travelling via Istanbul. 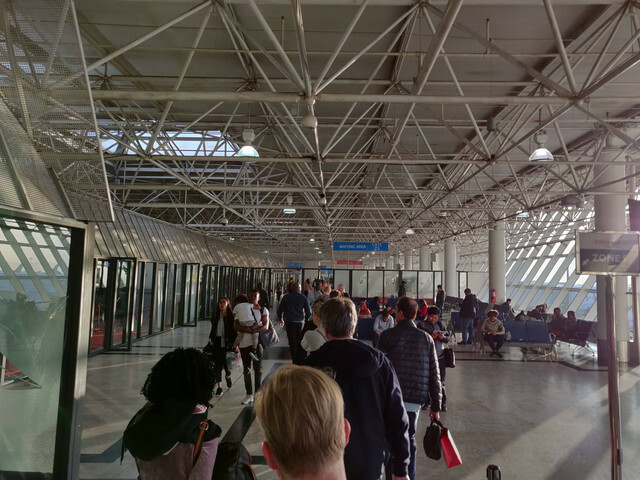 When entering the airport, we were led to the departure lounge where we had no access to any stores or restaurants. But it was fine in our case since we didn’t had that much time anyway. 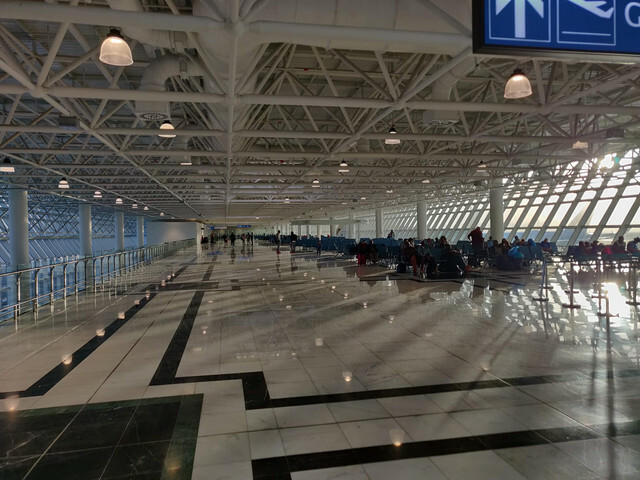 We arrived in the old part of terminal 2 and our next flight was set to depart from the newly built east wing. 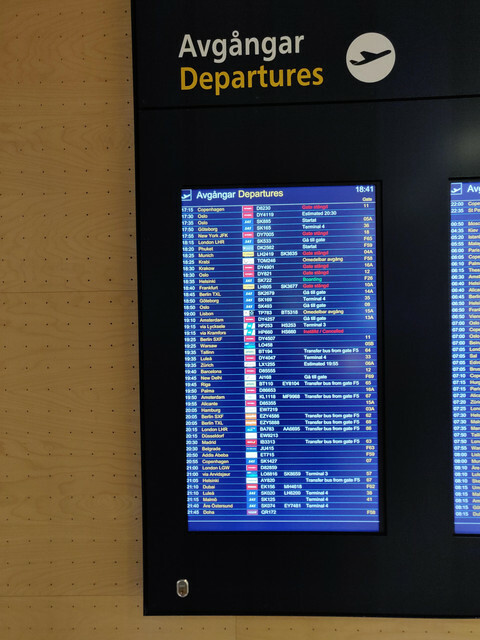 The signs and information were bad with very few screens showing departing information and the gate signs was small and facing in wrong direction. 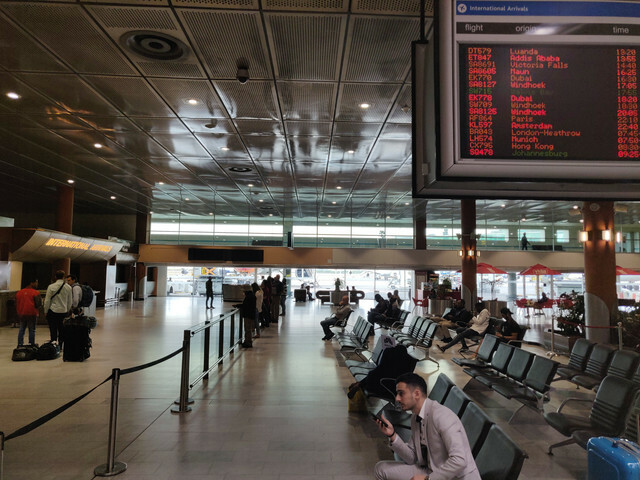 When we came to gate 15 the screen displayed the last flight to Paris which was somewhat confusing. 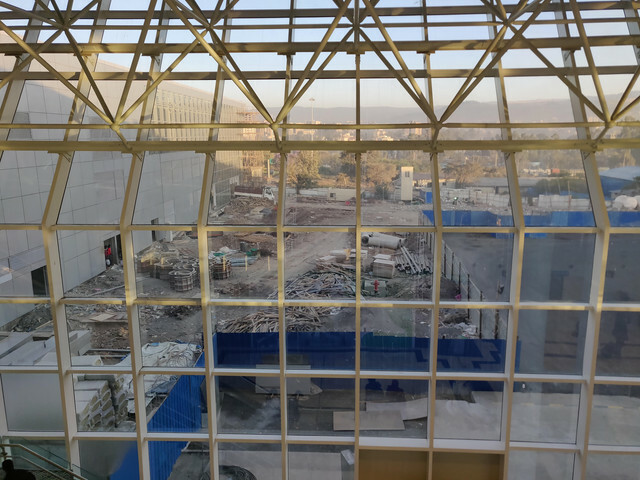 During our walk we saw a glimpse of the continuous work of the airport expansion and as I had understood the airport is aiming to expand even more during the following year. 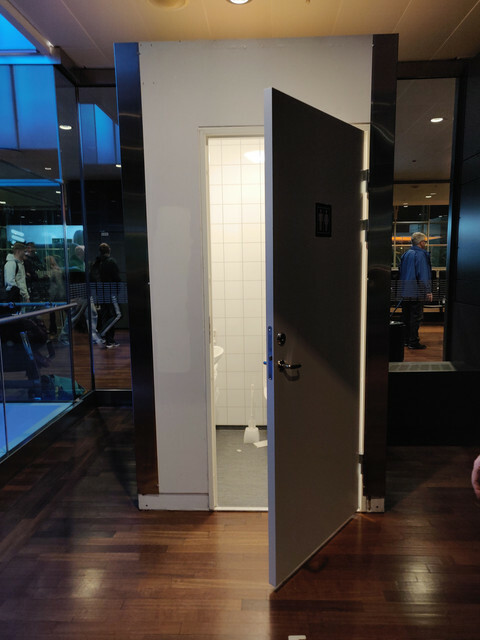 With that being said we saw some temporary toilets in the terminal, similar to what you find on a construction site, because of the construction happening inside the terminal. The toilets in the newly built east wing was fine but some were missing toilet paper. 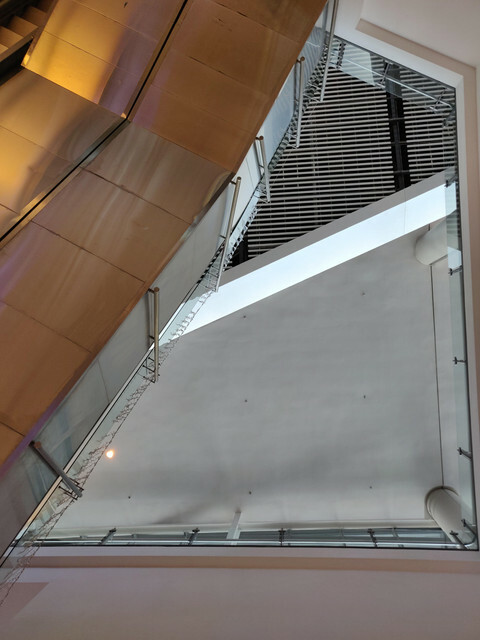 I have worked with airport development in Sweden and it is funny to see the building and the interesting architecture. 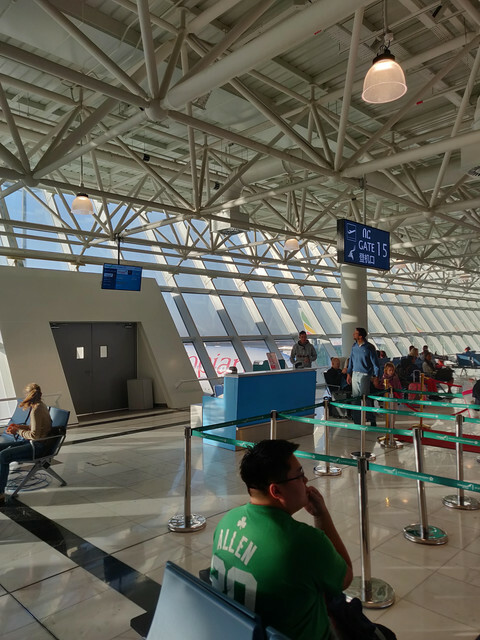 You can really see that this is a terminal built to work which is really charming, not to be amazingly beautiful like Doha or elegant like Zurich. 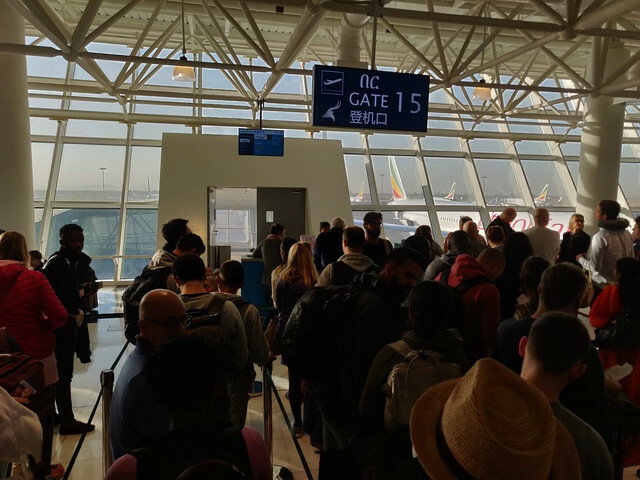 Before boarding the passengers was divided in to different zones which has a bit confusing since there weren’t any signs telling which people to stand where. Finally, we boarded the plane towards our destination! Watch my video of this flight here! 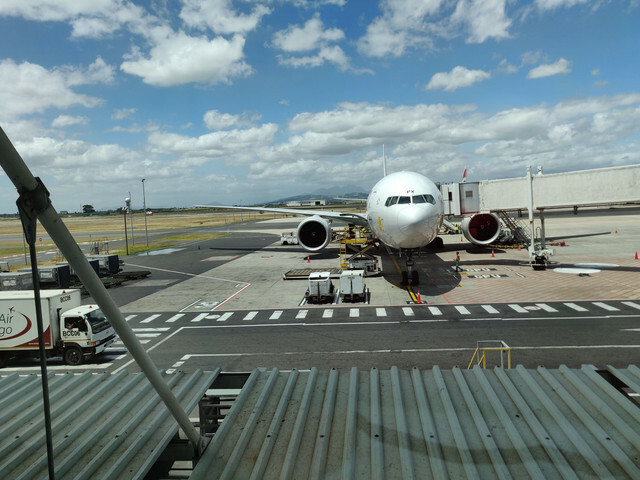 The first impression of the airplane was that if felt way older than the last airplane that we travelled on. It was of coarse the case, but the airplane is only five years old and could have felt even newer. It was smelly, and the seats looked dirty. I really like the colourful seats, it has one drawback; that it shows dirt easy. We sat in a “normal” row and I and I had a window seat. 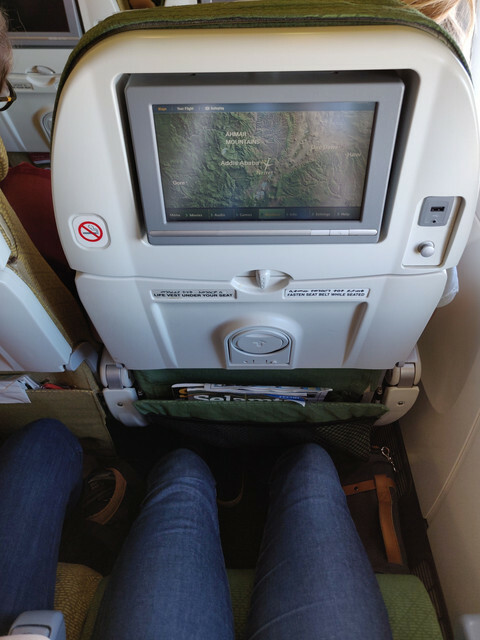 The width of the seat was considerably larger which was great, but the seat pitch was naturally smaller than the last flight but fine for me. We got a pillow and headphones and the flight was departing surprisingly fast. 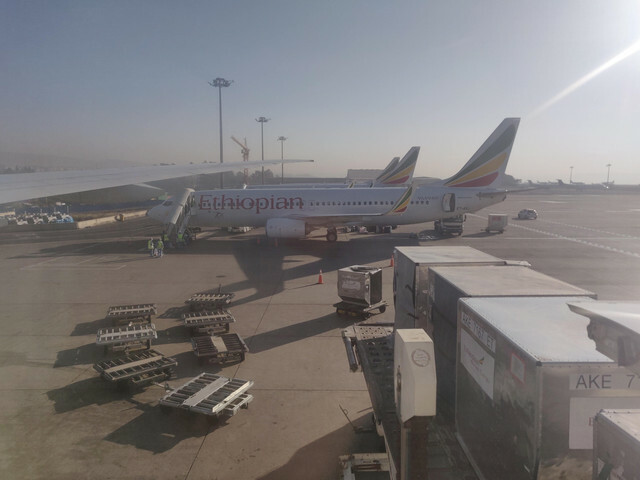 The take-off was beautiful in the morning light over Ethiopia and we soon turned left towards the south (look at the video above). After about one hour or so they started serving a lighter breakfast with just a packed sandwich and some drinks. The sandwich was not that great at all, I really appreciate the fact that they first served a smaller meal followed by a bigger “lunch”. I slept during some parts of the flight that for most times was smooth and enjoyable. The IFE on this flight had roughly the same number of movies and music etc. 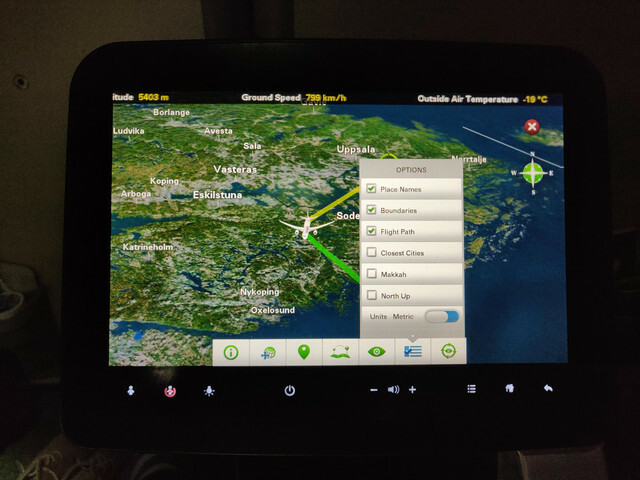 but the quality and usability of the screen was far behind the one on the first flight. You really notice how fast these kinds of product develop since I can’t imagine that this system is that old. The screen was a bit dim and none of the USB ports on my row was able to charge my phone. 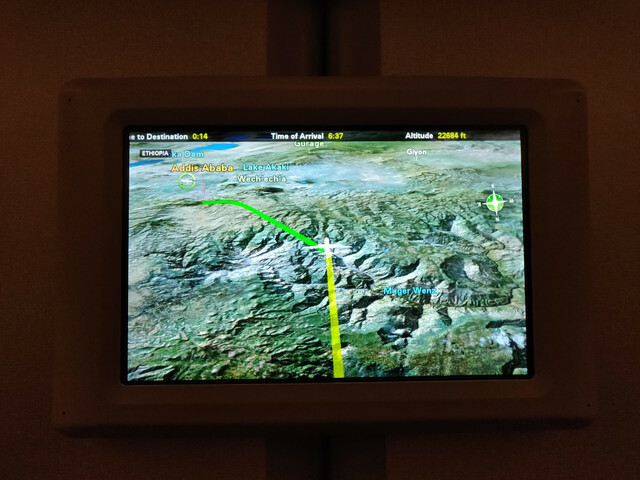 I still enjoyed watching the map as our plane travelled across the continent. 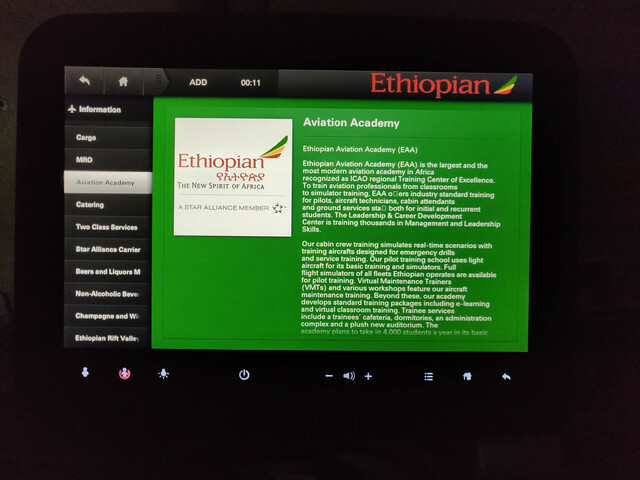 It is a shame that you can’t use your own headphones combined with the IFE since the one you get are not great, but that is not just with Ethiopian. With the second serving we had the choice between meat and chicken and I choose chicken again but my family took beef which made me able to taste both. This meal was not as good as the last one as the chicken looked and tasted bland. The only upside was that is wasn’t dry at all. 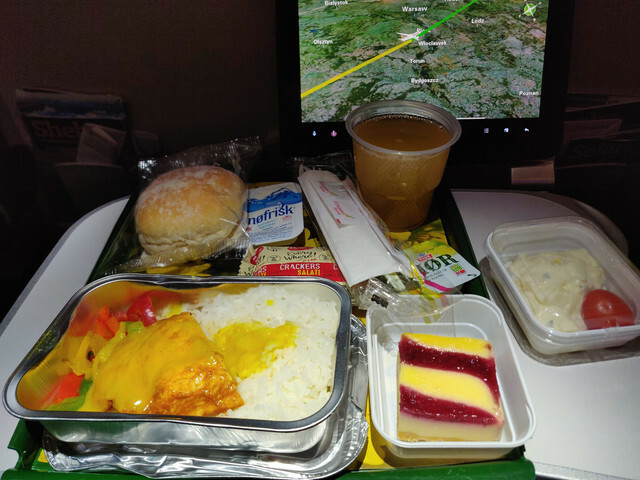 The bread was better than the previous flight, but the other smaller dishes brought on the plate was not great at all. The dessert was artificially tasting, a bit like the smell in a urinal and the pasta was overcooked and melted in my mouth. So, the overall experience was disappointing. The service on this flight was also lacking. 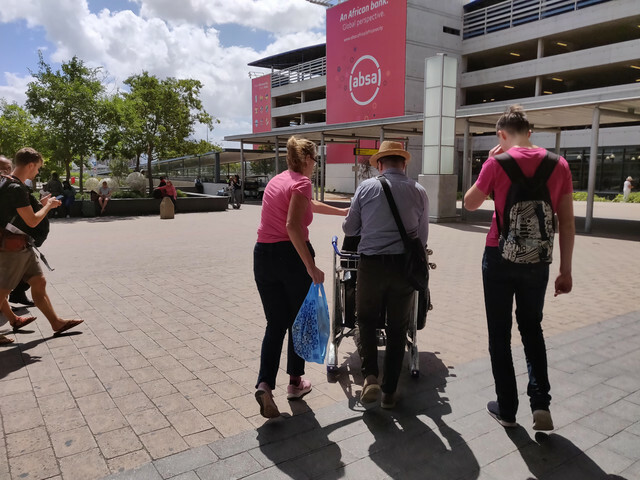 A family member tried to get the attendants attention multiple times without them noticing him. 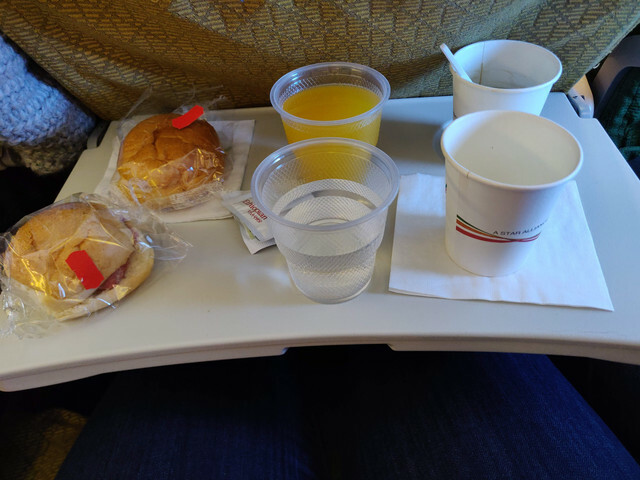 They did serve water one time during the flight which was nice! 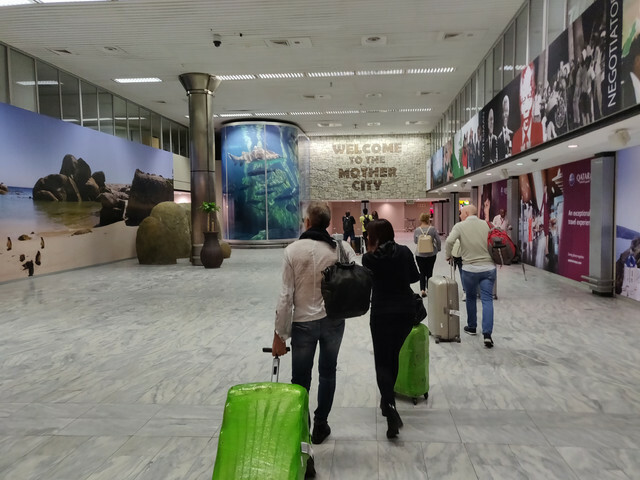 Finally, we landed in Cape Town before schedule. 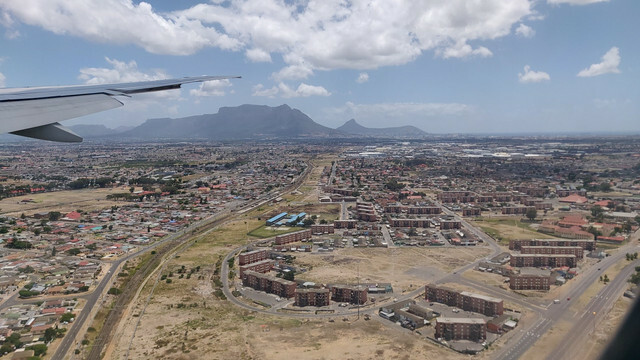 The landing was beautiful as the sky was clear and I looked out over Cape Town and Table mountain.The disembarking process took a lot of time since there where only one jet bridge and we were on row 41. 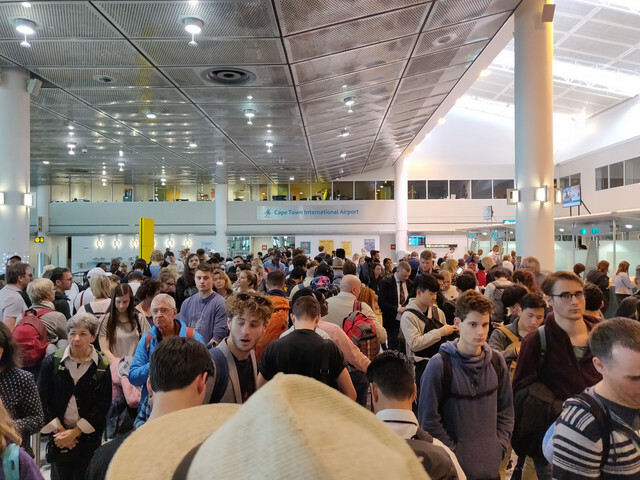 After the disembark we was faced with a massive queue to the passport checkpoint. 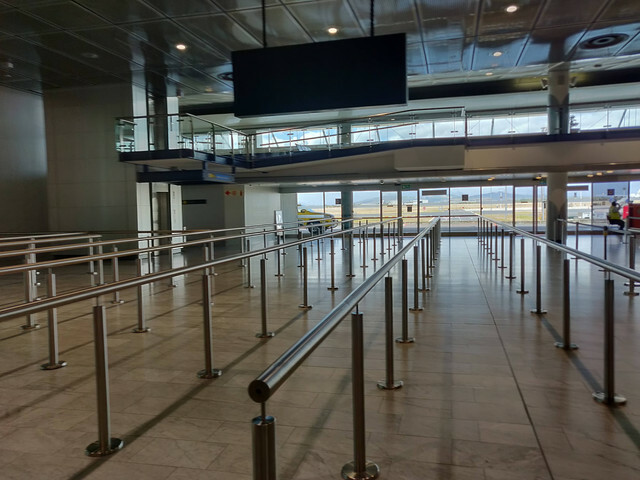 As we were the last ones to disembark we was the last ones in the line. The wait was about 45 minutes and not all the lines where opened. I can just imagine how it must be if more than one plane arrives at the same time. 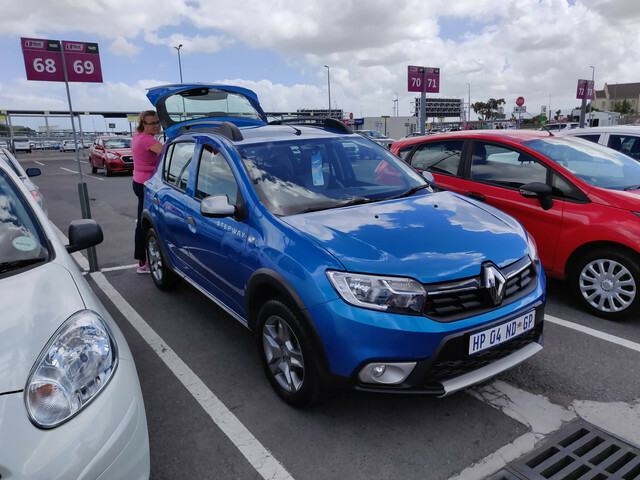 When entering the baggage claim all our luggage was standing next to the belt and we could proceed to the car rental outside the airport through the cosy arrival hall and continued our trip to our final destination; Paternoster. 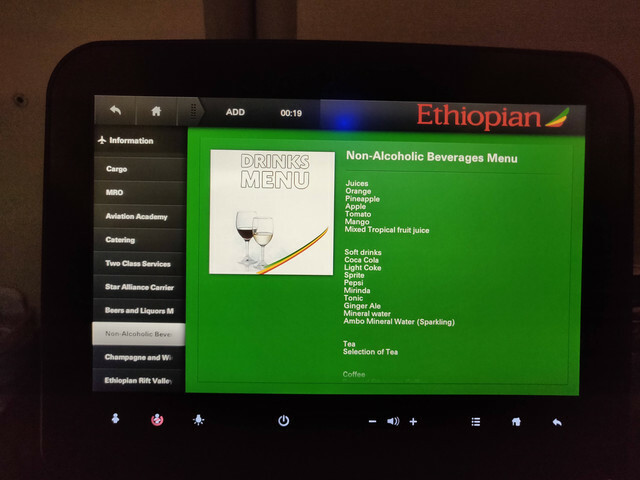 To conclude this trip report, I must say that Ethiopian just is behind the middle east airlines with a notch. The food and service are not on par but are quite close. 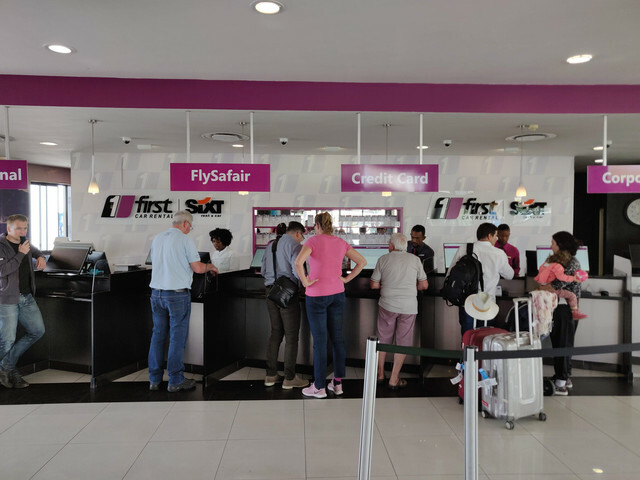 In the case of travelling from Stockholm, or Europe for that matter, to South Africa I would consider them as the flight times are much more comfortable. Flying for about six to seven hours and six hours instead of flying for three hours and ten hours. Addis Ababa wasn’t as big or good as the ones in the middle eat or Europe but does its job. 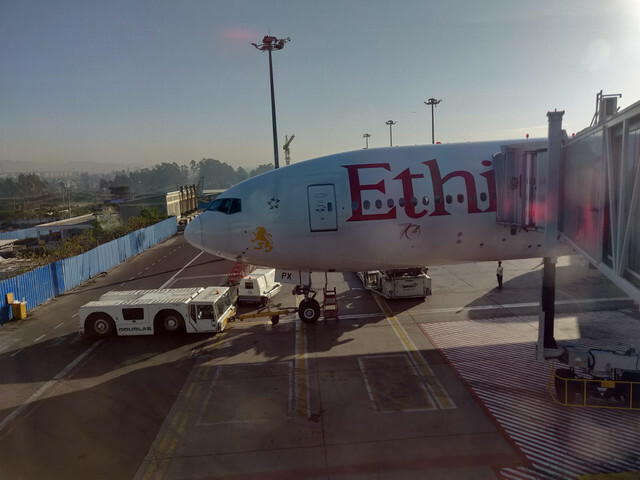 I really hope that Ethiopian will continue to develop and become even stronger on the international market to bring the African spirit out in the world. Very nice report Simon with excellent pictures. Thanks for sharing! 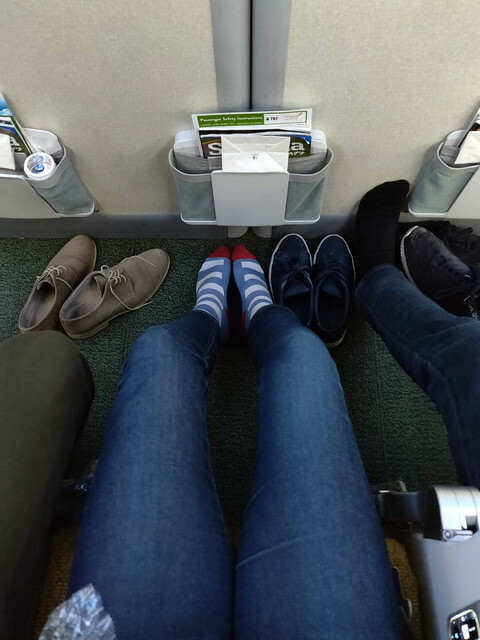 Glad you managed to get first bulkhead seats with generous legroom for free! 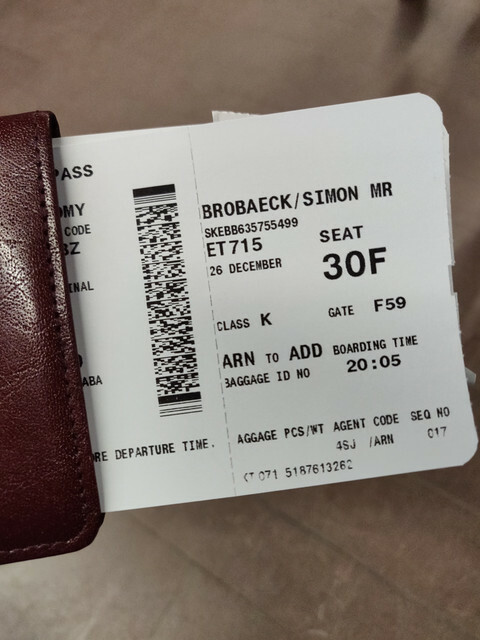 Do you have an Star Alliance elite statut (with SAS maybe)? 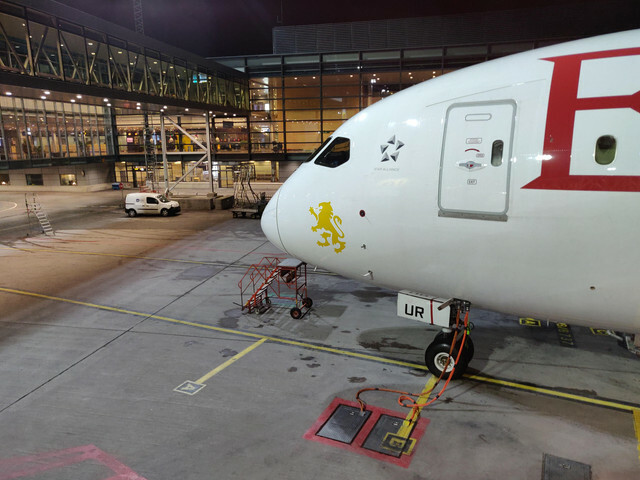 Not really because, usually, allowance to/from sub sahara Africa is typically 2*23kg in Y and 2*32 in J for many European and/or African airlines. 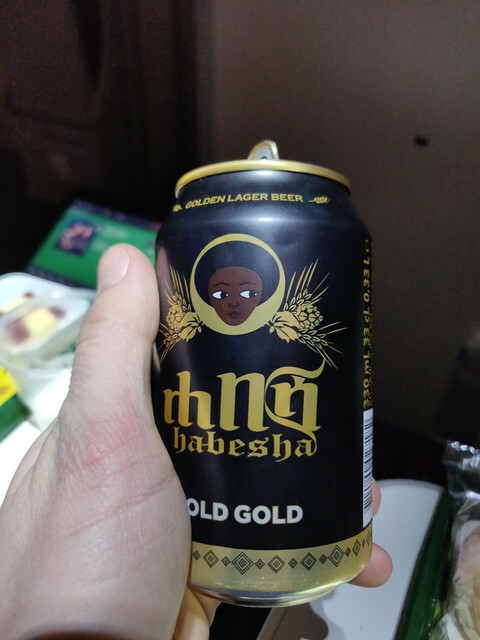 The only thing enjoying me during the flight was the constantly “dinging” noise as for someone pressing the assistant button above their seats. 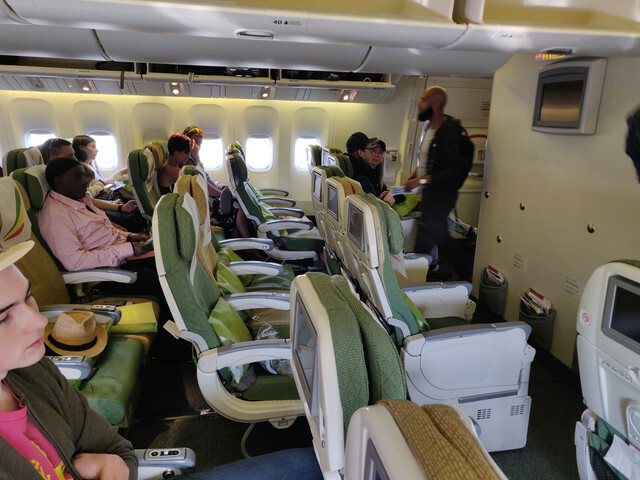 I don’t know if the sound was especially loud close to the crew telephones and seats located in front of us. I have never heard so much alert sounds on an airplane. Do you remember if on the 789, the IFE remote is built in the armrest like on your second leg on the 77W? If yes, it may explain why staff button was accidentaly hit so many times by sleepy passengers which for sure is irritating! Anyway looks like ET did a good job! Looking forward to the return journey with, eventually, a sunny bonus from the stunning Mother City. Excellent TR on what I think is an exotic airline (nice socks btw!). It is amazing to see this airline grow adding more and more destinations every year. 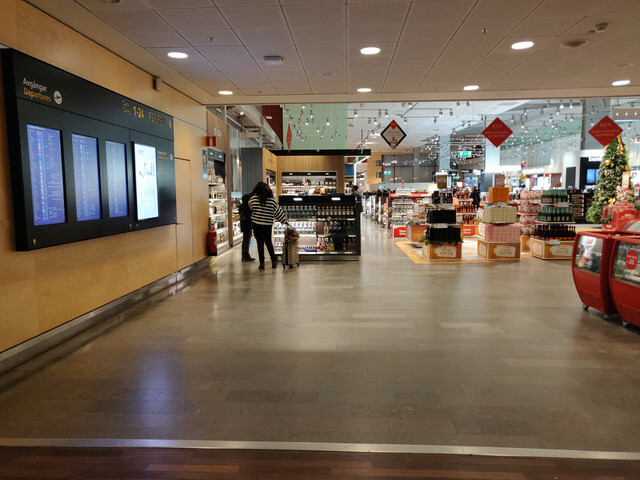 I am surprised that ET does not operate direct flights to OSL and needs to stop in Sweden. 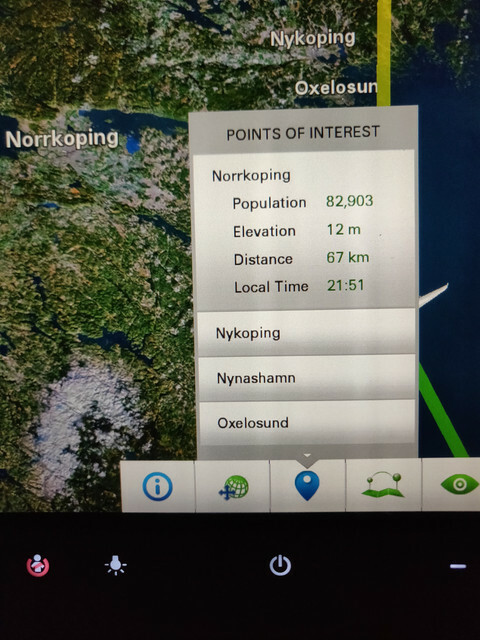 Does the airline have rights to operate on the OSL - ARN routing? 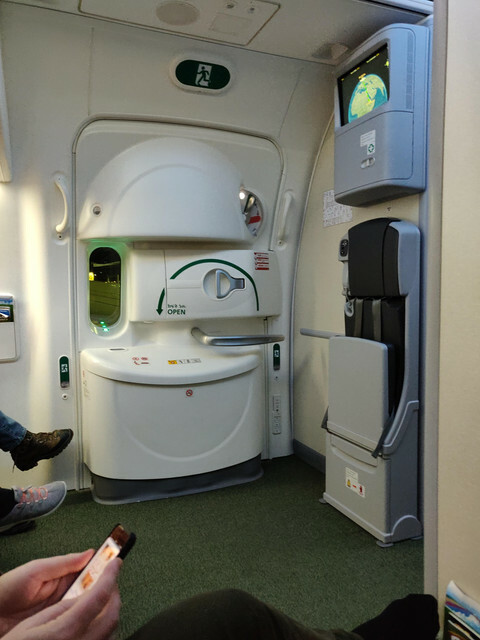 Sitting at the bulkhead seat, did you feel colder there? 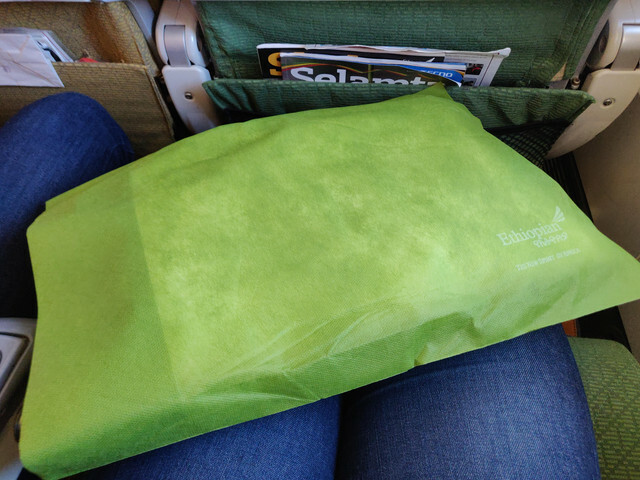 I tend to avoid the first row just because you cannot keep an eye on your bags. I am quite conscious of airline theft these days and always tie my bag strap around my leg when I sleep. 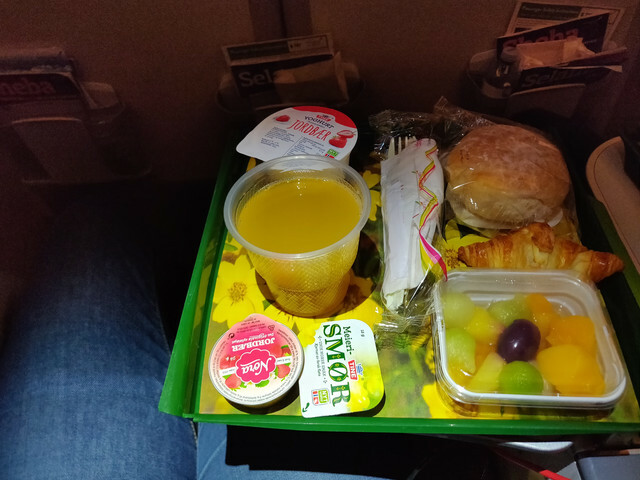 Do you know if the airline provides any snacks in-between meal service? Your meals look ok, not sure about that potato salad, like you said seems to be too much mayo. How responsive did you find the PTV? Nice to see their B777 are still in a 3x3x3 config. 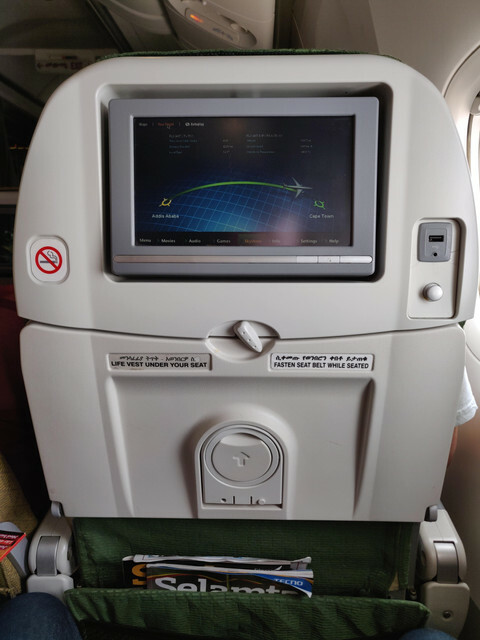 Do you remember if on the 789, the IFE remote is built in the armrest like on your second leg on the 77W? If yes, it may explain why staff button was accidentally hit so many times by sleepy passengers which for sure is irritating! 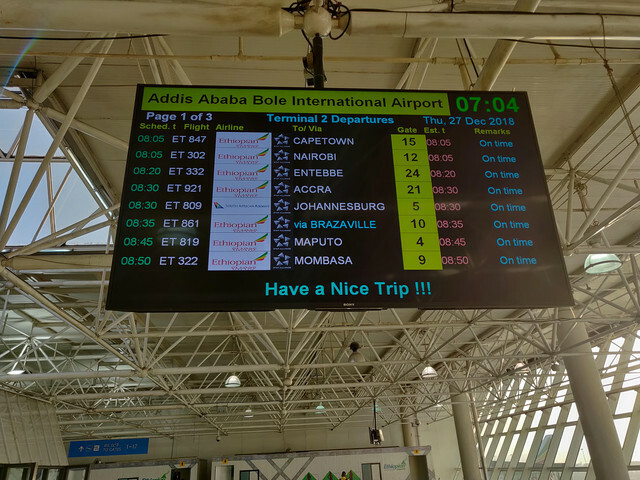 Surprised there is Simplified Chinese signage even in Africa! The yuan definitely speaks out loud in the world now doesn't it?